How often is 'antifreeze' added to food and drink? Bottles of a flavoured whisky brand have been removed from shops for containing high levels of an antifreeze ingredient. How often is propylene glycol used in food and drink, asks Chris Stokel-Walker. 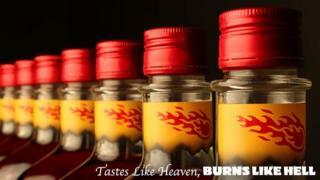 Fireball Cinnamon Whisky "tastes like heaven… burns like hell", its manufacturer, Sazerac Company, claims in marketing materials. According to market research firm Nielsen, the whisky is one of the top 10 bestselling drinks in the US, beating popular brands such as Jose Cuervo tequila. The drink has been removed from shelves in Norway, Sweden and Finland after batches of the whisky made to a recipe acceptable in North America - where 50g of propylene glycol per kilogram of food or drink is acceptable - made their way to Europe, where the limit on the substance is lower, at 3g per kilogram. The manufacturer says a mix-up caused US recipe whisky to be sent to Europe. Food or drink ingredients being acceptable in the US but not in the EU is not uncommon, says Peter Ho, a food processing lecturer at the University of Leeds. "In general, there are different standards set. It could be for a variety of different reasons, including where research expertise lies." The headlines have all made reference to antifreeze, but the Fireball situation is completely different to the Austrian wine scandal of 1985. Then diethylene glycol - which can easily kill - was used to improve the flavour of sweet wine. In this instance the substance propylene glycol, while not without controversy, is a common food additive used for a variety of purposes. According to propylene glycol producers in Europe, 730 kilotonnes of the chemical were produced across the continent last year, one third of which was for food manufacture. Propylene glycol is also used in e-cigarette manufacturing, says Chris Kinnserley, a food safety expert, though some users have raised concerns that it can cause an allergic reaction, causing throat irritation. As a result some e-cigarette manufacturers have swapped out propylene glycol for vegetable glycerine, a plant-based alternative also used in the food and drink industry. The Sazerac Company has said in a statement that the recall is a "technical compliance issue". It added that propylene glycol is "a common, perfectly safe, FDA and EU approved flavouring agent used in more than 4,000 products", including alcohol, soft drinks, and biscuits and cakes. They've also reassured customers that the drink, made to a recipe compliant with EU regulations, will be back on shelves within three weeks.